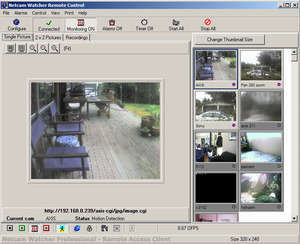 Netcam Watcher Professional is a Digital Video Recorder for Network Cameras that can record from multiple cameras simultaneously.The faster the system, the higher the overall frame rate that you will be able to achieve. Performance is usually limited.use the school's existing network (unused at night) to monitor school premises for vandalism and general security. Version 3.3 is a freeware program which does not have restrictions and it's free so it doesn't cost anything. For security reasons, you should also check out the Netcam Watcher Professional download at LO4D.com which includes virus and malware tests. Additional screenshots of this application download may be available, too.